Latvian fishing companies are seeking EU compensations for the losses incurred after the detention of the Senator crab trawler on the Norway's Arctic shelf due to a fishing ban and a subsequent idle standing of their vessels, according to the European Crabbing Association's petition, which the government is expected to review at a close meeting on Tuesday, writes LETA. According to the association's letter to Prime Minister Maris Kucinskis, Agriculture Minister Janis Duklavs and Foreign Minister Edgars Rinkevics, Latvia has legal grounds to demand EU compensations for the losses that have occurred because of the bloc's failure to ensure the exercise of its legitimate rights in the fishing grounds around Norway's Svalbard archipelago. Latvian companies North Star LTD and Baltjura Serviss have been busily preparing for the new fishing, starting January 1, 2017, since the Council of the EU on December 14, 2016 licensed 11 Latvian boats to fish in the seas around the Svalbard archipelago. The preparation works included hiring fishing crews, preparing fishing gear, repairing ships, arranging product supply chains and other costly activities, the association says in the letter to the government. "The idling costs of the illegally detained boat Senator reach at least EUR 6,831 a day or EUR 205,000 a month (wages to the crew, fuel, heating, insurance, port charges, etc.). Since North Star LTD company has six vessels in its fleet, all of which have been preparing to start fishing at the beginning of this year, the fleet's total idling losses reach roughly EUR 731,179 a month, excluding the EUR 180,000 fine the Norwegian authorities want to charge before they release the vessel. Another company, Baljura Serviss, which has five vessels in its fleet, is only estimating its losses. The entire Latvian crabbing fleet remains practically idle since September 2016," the authors of the letter indicate. The association also expresses readiness to provide detailed calculations of the losses to the authorities concerned. As reported, the Latvian crab trawler Senator has been arrested on January 16 for fishing snow crab in Norwegian waters off the Svalbard (Spitzbergen) archipelago. The Independent Barents Observer reported that the Latvian boat was detained as its crew was illegally crabbing on the Norwegian shelf in the Svalbard fishery protection zone. 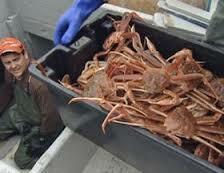 The Senator had reportedly put out 2,600 snow crab traps in the area without the Norwegian authorities' permission. The crabber was subsequently forced to set course to the port of Kirkenes. The Latvian Foreign Ministry has presented the Norwegian Embassy in Riga a note asking to release a Latvian crab trawler with a crew of 30 people detained in Norway for catching snow crab in Svalbard. The ministry’s spokesman Raimonds Jansons told earlier that the Latvian side had also asked the Norwegian authorities to not interfere with crab fishing which has been taking place in accordance with international agreements. Jansons cited the legal framework allowing Latvians to fish in this territory, including the 1980 bilateral fisheries agreement between the European Union and Norway, providing for annual talks on fishing rights in particular territories outside the EU, including Svalbard fishing grounds. The Foreign Ministry official also mentioned the 1920 Paris agreement ensuring non-discriminatory access to fish stocks. “To us, it is important that the talks are led by the European Commission. Taking this case into consideration, we will work in Brussels with the European Commission to resolve this issue. Bilaterally, we have presented the embassy a note, citing the above agreements, the non-discrimination principle, access to fish stocks, and asking to release the ship and not to interfere with fishing that takes place in accordance with international agreements,” Jansons said. In December 2016, the Latvian Agriculture Ministry’s representatives at a meeting of the EU Agriculture and Fisheries Council succeeded in securing crabbing licenses for Latvian fishermen in the Svalbard archipelago in 2017.